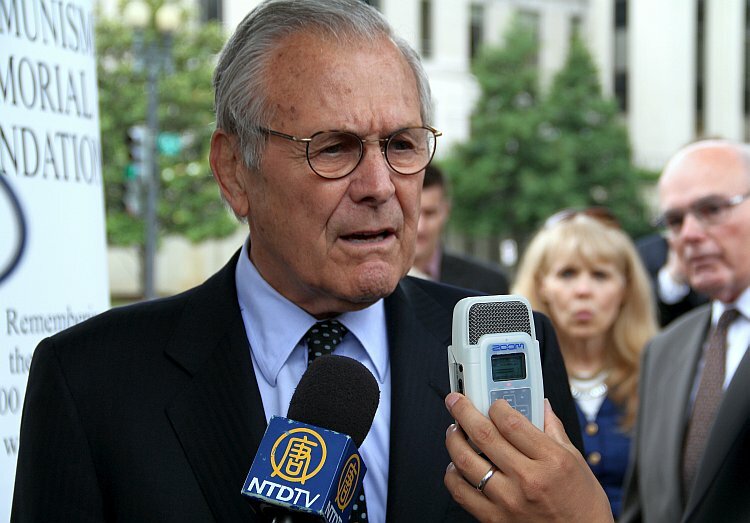 WASHINGTON—Communism is responsible for the death of more people than any other movement in history, former U.S. Secretary of Defense Donald Rumsfeld said upon receiving the Truman-Reagan Medal of Freedom from the Victims of Communism Memorial Foundation, at Capitol Hill on June 12. “And we know it continues today,” he said gravely as he looked out at the assembly of those who had endured, or whose people continue to endure, the oppressive rigors of communist regimes. Having served as defense secretary for both President Gerald Ford and President George W. Bush, Rumsfeld, now 80, remains both the youngest and oldest person to hold the position. He noted that President Truman and President Reagan were from different political parties, but were united in their view of communism. The Medal of Freedom is given to individuals who have distinguished themselves in opposing communism and tyranny. Previous winners include the late U.S. Rep. Tom Lantos, Poland’s Lech Walesa, and Pope John Paul II. The presentation coincided with celebrations for the fifth anniversary of the Victims of Communism Memorial. A bronze replica of a statue erected in 1989 by Chinese students in Beijing’s Tiananmen Square, the “Goddess of Democracy,” now stands on a busy intersection near the U.S. Capitol. Tom Lantos’s widow, Annette Lantos, now chairwoman of the Lantos Foundation for Human Rights and Justice, spoke at the event. She had lost most of her family under the Nazis and then experienced firsthand the communist takeover of Hungary. “How easy it is to ignore the lessons of history—and how distressingly easy it is to repeat them,” she told the audience. Representatives from Chinese, Tibetan, Vietnamese, and North Korean communities joined many from former Soviet-occupied countries to lay wreaths at the memorial site. Anhthu Lu, one of over a million people who fled Communism in Vietnam by boat, spoke briefly about the horrors of that journey. Vietnamese ‘boat people’ were “robbed, raped, and abducted” she said. Over one-third perished at sea and another third died in countries and remote islands scattered through Southeast Asia. “The Vietnamese communist regime persecuted them even in the grave; markers to remember the boat people were destroyed at the pressure of Hanoi,” she said. Reggie Littlejohn, founder and president of Women’s Rights Without Frontiers, described the “Goddess of Democracy” as a fitting memorial to the Victims of Communism. Instrumental in publicizing the recent plight of blind Chinese dissident Chen Guangcheng, Ms. Littlejohn said over 60 million people are estimated to have died as a result of the Chinese Communist Party (CCP), including those in forced labor camps, and through the repression of Tibetans, Uighurs, and the Falun Gong. But she believes the number is much greater.